Although this print cannot be attributed it is dated. 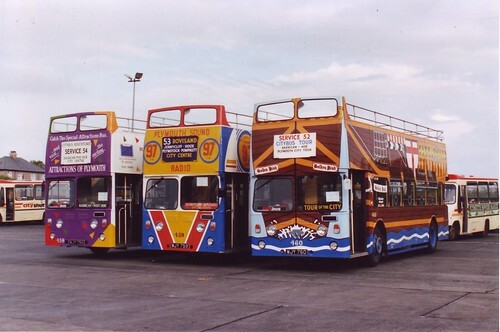 On the 13th of August 1989 these three Leyland Atlantean PDR1/1s of Plymouth City Transport were lined up, presumably for publicity purposes, on company premises. PCT experts among you can probably tell me whereabouts in the City this is. Nos. 458, 459 and 460 were new to Plymouth in September/October 1962 as Nos.158/9/60. At that time their 77 seat Metro-Cammell bodies were closed top. During the 70s they were converted to open-top, given a yellow and white livery and named "Sir Francis Drake", "The Spirit Of Plymouth" and "Golden Hind" respectively. This photo shows their newly applied garish late-eighties colour schemes. No.458 is currently preserved in the livery of Keighley Transport and can be seen here; www.flickr.com/photos/db3435/2269791708/ The other two have been scrapped although the registration mark WJY759 has been transferred to a newer Atlantean. Its just a shame that we no longer have open toppers in Plymouth these days, at least not in regular service anyway.